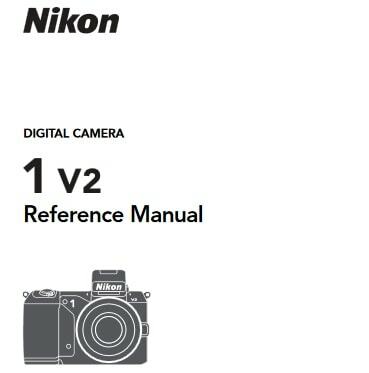 Nikon 1 V2 Manual is aimed to fulfill the needs toward information of both technical or instrumental issue among this digital camera product especially for Nikon 1 V2 model. This model is the upgrade to the previous Nikon 1 V1 model. It is include a new 14.2-megapixel CMOS sensor that captures still images at 15 frames per second with full autofocus tracking, thanks to the sensor’s built-in phase-detect autofocus system. Nikon 1 V2 also captures Full HD movies at 60i or 30p. The Nikon 1 system’s CX sensor is smaller than even Micro Four Thirds cameras, allowing for smaller lens designs, though the bodies are about the same size as competing mirrorless cameras. When Nikon 1 V2 was firstly released to the market? How much the price when Nikon 1 V2 firstly released? Nikon 1 V2 is a good choice for anyone who wants an easy to use camera that delivers good-looking pictures with pleasing color and plenty of resolution. It was announced by Nikon on October 24, 2012. In the first release, Nikon 1 V2 pricing with a 10-30mm kit lens for about US$900. A two-lens kit includes the 10-30mm and 30-110mm lenses for $1150, and body-only the Nikon V2 will be US$800. Now, if you’re interested to own this compact digital camera device, you can get it in several online stores by paying for the used products start from $498.00 of the Nikon 1 V2 14.2 MP HD Digital Camera with 10-30mm VR 1 NIKKOR Lens. digital camera especially of Nikon 1 V2 models. Read this manual thoroughly before use, and keep it where all those who use the product will read it. Feel free to download the nikon 1 v2 manual user guide at below. Visit here to go back for the list of Nikon User manuals here.